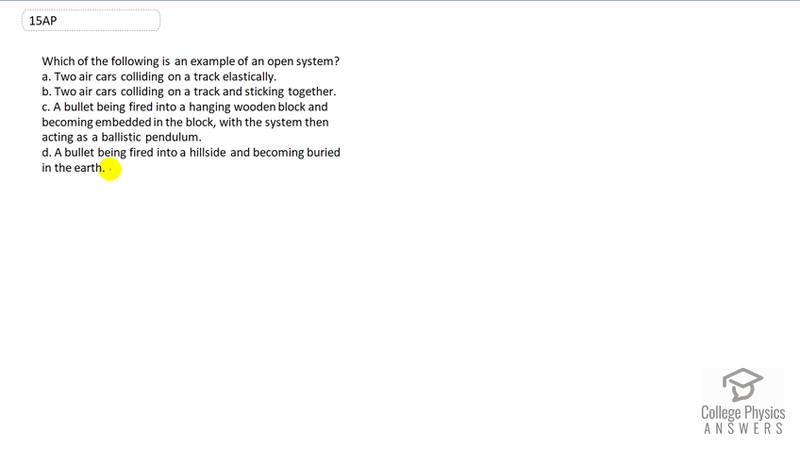 Which of the following is an example of an open system? Two air cars colliding on a track elastically. Two air cars colliding on a track and sticking together. A bullet being fired into a hanging wooden block and becoming embedded in the block, with the system then acting as a ballistic pendulum. A bullet being fired into a hillside and becoming buried in the earth. This is College Physics Answers with Shaun Dychko. When a system exchanges energy or matter with some other thing that's not part of the system and that means it's an open system. So the answer for this question is D because some of the kinetic energy of the bullet is being transferred to something else besides the hillside and the earth. It's transferring some energy to the air above the earth and for that reason, it's losing the -- the system is losing energy to something else that's not part of the three things mentioned here, bullet, hillside or earth. So this is an open system.